It may be fairly well known that the only man to hit a ball over the Lord's Pavilion was Albert Trott in 1899 but maybe not as much is known about the man himself. Steve Neal's book, Over and Out, is therefore very welcome. 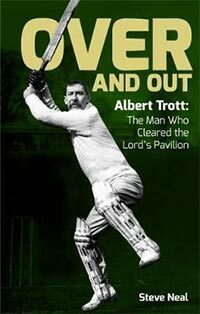 An entire book on a man who played just five Tests may seem strange but there is much of interest about Albert Trott. One of a very small number to represent both England and Australia, Albert was born in Australia before moving to England. One wonders if this would have been the case had he been given more than the two appearances in Tests for his native country. His brother was also captain around this period and represented Australia on twenty-four occasions. Having made the move to England, Albert became a well-known figure at Lord's and was renowned for his big hitting and various forms of bowling. His enterprising play made him one of the main cricketing figures in both England and Australia. Residency rules possibly counted against him which may explain only representing England in three further Tests. Not all, though, went to plan. When his cricketing abilities waned, money issues became a problem. His wife returned to Australia with their two daughters without him although they did not divorce. Off the field, alcohol and gambling took their toll and, at the age of 41, Albert Trott killed himself. Over and Out is a most interesting book. Steve Neal's interest in Trott is to the benefit of many as this book will tell the story of a cricketer who deserves to be remembered more than possibly he is. A lot of detail is given about Albert's performances whilst commenting on how people generally viewed him in both countries. Over and Out also paints a picture of what life was like in both England and Australia and Steve is to be congratulated on a most interesting book.